The growth of the short-term home and room rental marketplace Airbnb has been nothing short of explosive. From its inception in 2008 as a small experiment by it’s founders to make some extra money to cover rent during a design conference in San Francisco, it has grown into a global hospitality behemoth valued at 31 billion dollars with 4 million properties listed. Leveraging the power of the sharing economy, this growth has been possible without Airbnb owning a single property. Airbnb has emerged as a significant threat to the incumbent hotel industry, which is tightly regulated. One study has shown that the introduction of Airbnb has estimated that the causal impact of the introduction of Airbnb on hotel revenue is in the range of 8-10%. In addition to this, there are concerns about the impact that Airbnb has on rental markets which are already very tight in large cities. These concerns, public demand as well as demand from the incumbent hotel industry has led local governments globally to try and regulate Airbnb. These regulations have taken various forms, some governments require special licensing for properties listed on Airbnb others have put in place rules that prevent apartments from being rented out for extended periods of time arguing that this puts added pressures on rental markets. In light of these facts, an interesting question to answer is the extent to which Airbnb is a pure peer-to-peer sharing economy market place where excess capacity is shared or if it is, as critics point out, a platform the allows businesses to operate on it. Whether the critics are right in demanding the sort of regulation that could impede Airbnb’s growth is another debate in itself, one that I will not get into. Enough talking, I will let the data speak for now. 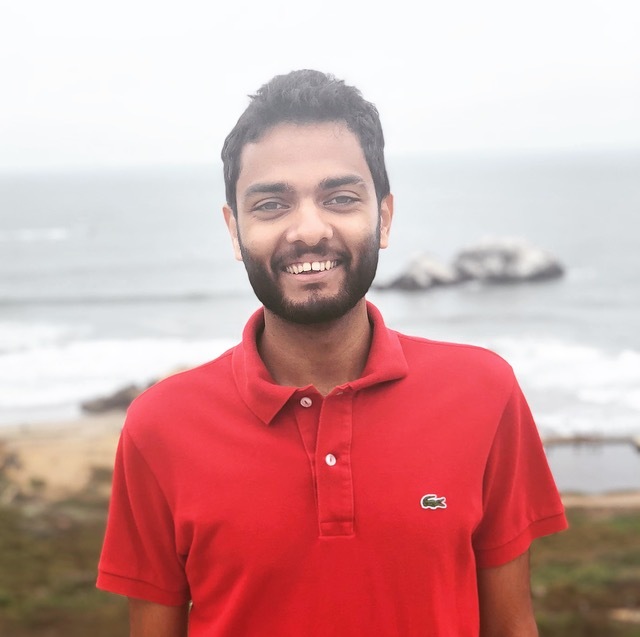 I use data from San Francisco that is available on insideairbnb.com, a website that regularly scrapes the Airbnb website to collect data on listings to construct visualizations to try and answer this question. The data is fairly detailed and includes the characteristics of all the listings on the platform including free text reviews of properties. I used Tableau to build the visualizations along with Python and good old Excel to wrangle the data. I built these visualizations for a data visualization class that I took, the goal was to incorporate principles from data visualization to tell rich multivariate stories in an easily accessible manner. The visualization above tells a very interesting story. It is quickly apparent that about 14% of hosts on Airbnb control about 31% of properties listed in San Francisco. 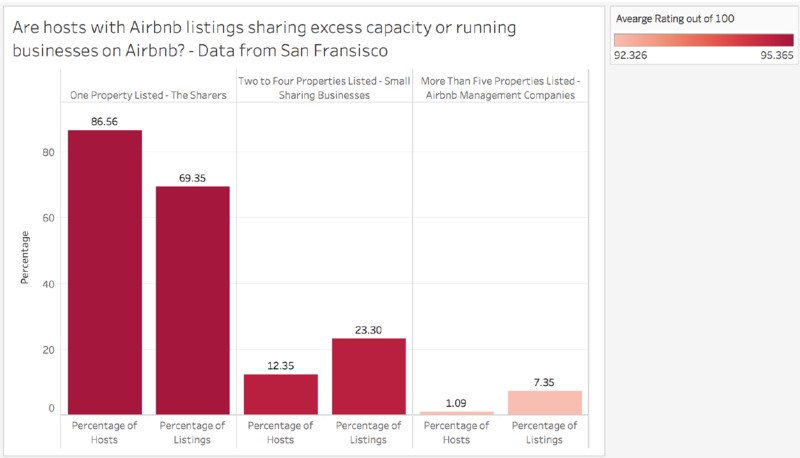 These hosts with multiple properties listed are more likely to be using Airbnb as a business platform as opposed to sharing excess capacity. In addition to this, the color encoding shows that there is a difference in the ratings that hosts with multiple properties get versus hosts with a single property listed. The results for this are revealing, the personal connect that an individual host likely has as opposed to a professional Airbnb host results in a variation of about 3 points in the average review received. While on a 100 point scale the difference seems small, something to put this in perspective is the fact that a significantly large percentage of Airbnb reviews are greater than 90 out of a 100. 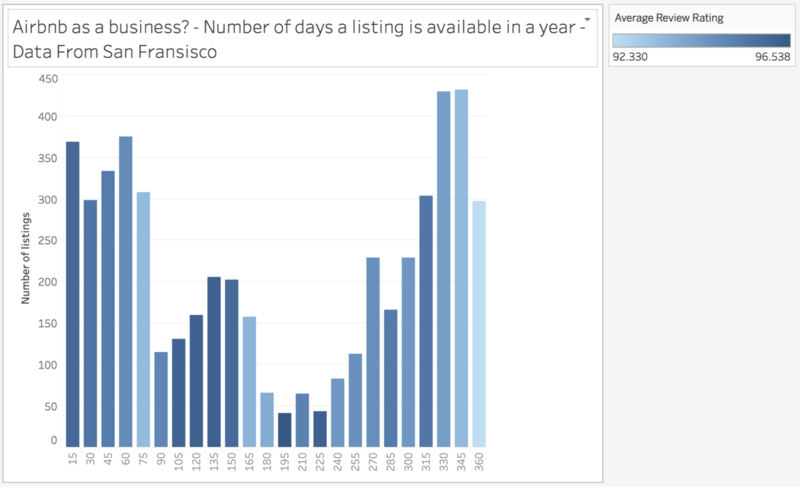 Another way to segregate hosts that share excess capacity from hosts that use Airbnb to permanently list properties is by investigating the number of days a property is listed on the platform in a year. This visualization reveals a ‘U shaped’ distribution, there are a large number of properties that are listed for short term rentals, less than 75 days in a year. And on the other end a large number of properties that are listed for greater than 270 days in year. In terms of the review scores, again encoded using color, it shows that the properties listed for shorter durations, where presumably hosts personally manage the experience, have on average better ratings than properties listed for long periods of time. As a strong believer in the promise of the sharing economy, I am of the opinion that while regulation of these platforms is required, regulation that is reactionary to incumbent business interests and not data driven is harmful. Policymakers should leverage data and arrive at data driven conclusions that inform regulatory action. With respect to Airbnb, the debate is far from settled. Questions such as the causal impact that Airbnb listings have on rental markets are still to be answered.